This course explored connections between basic electronic circuits and the physical world, especially through digital networks. This was a hands on prototyping and design course. Picking up from where Electronics for Artists left off, the course focuses on new ways of connecting the physical world to new local and networked inputs and outputs. Students will continue developing prototypes using the Basic Stamp microcontroller and Macromedia Director to attach sensors that read local information from objects, people, or physical spaces (such as heat, light, sound, vibration, movement). 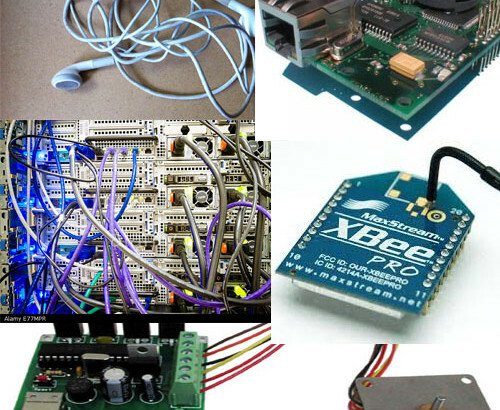 We will also look at ways of connecting microcontrollers to networks (such as GPS, Ethernet (SitePlayer), radio frequency, infrared, and the Internet) to experiment with bridging the gap between real and virtual worlds. Other topics for exploration include: overview of network protocols and networking, mobile computing including wireless and mobile telephony languages (WML, CHTML, VXML), handheld computing, Warchalking and Wardriving, and basic overview of analog electronics. Four assignments, assigned readings, and class participation are required along with a final project.